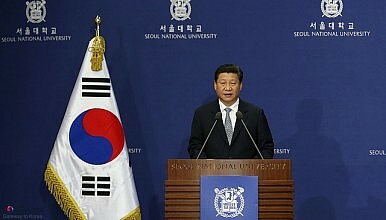 Can Beijing and Seoul Become Strategic Partners? China and South Korea appear to be moving closer together. How far will this go? China’s President Xi Jinping will complete an exchange of state visits with South Korean President Park Geun-hye in the space of a little less than a year. This is a remarkable intensification of the relationship between Seoul and Beijing, especially when one considers that Xi Jinping has yet to visit Pyongyang or receive Kim Jong-un. Likewise, routinized summits between Seoul and Tokyo have vanished as Seoul-Beijing relations have intensified, raising questions in Tokyo about whether Seoul might prefer Beijing over the United States and Japan. But despite a burgeoning trade relationship between Seoul and Beijing that is larger than the combined value of South Korea’s trade with the United States and Japan, what future can Xi and Park forge for China-South Korea relations going forward, and to what purpose? For Seoul, the strategic payoff would come from Beijing’s acquiescence to Seoul’s leading role in shaping the parameters for Korea’s reunification. This has persisted as South Korea’s main objective for its relationship with Beijing since Roh Tae-woo achieved normalization of relations with Beijing as part of his Nordpolitik policy in the early 1990s. But while Beijing maintained the pretense of equidistance between Pyongyang and Seoul despite a burgeoning trade relationship with South Korea that has grown by more than thirty-five times over the past two decades, China’s leadership has shown great reluctance to abandon Pyongyang in favor of Seoul. China protected Pyongyang from international outrage following its 2010 shelling of Yeonpyong Island and all the top members of China’s Politburo publicly appeared at the North Korean embassy in Beijing to pay their condolences on the death of Kim Jong-il in 2011. But since North Korea under Kim Jong-un launched its third nuclear test in the middle of Xi Jinping’s transition to power in early 2013, the political relationship has soured. China seems to have been particularly shocked by Kim Jong-un’s treatment of his uncle, Jang Song-taek, whom Beijing had welcomed as Kim’s envoy a year prior to Jang’s purge and execution. Will Xi Jinping finally satisfy South Korea’s strategic yearnings by throwing Kim Jong-un under the bus? Probably not, as long as South Korea remains tethered to its alliance with the United States. And not so long as China continues to prize stability on the Korean peninsula as a higher priority than America’s primary objective of denuclearization and South Korea’s main objective of reunification. For Beijing, a main payoff from the visit to Seoul, aside from sending a not so subtle message to Pyongyang, will lie in securing Seoul’s cooperation with Beijing in criticizing Japan. There is no doubt that by visiting Yasukuni Shrine last December, Prime Minister Shinzo Abe has stirred up public outrage and distrust over Japan’s future intentions in both South Korea and China. Both governments and publics will continue to watch Abe’s defense moves like a hawk as Japan has breached its self-imposed cap on defense spending at one percent of GDP and has started a debate over the reinterpretation of Japan’s right to collective self-defense. But despite China’s sudden decision last year to celebrate the life of Korean independence fighter Ahn Jung-geun with a museum rather than simply a plaque, South Korea has thus far rejected the “outside game” of utilizing summitry with Beijing to gang up on Japan, in favor of an “inside game,” which is focused on pressing the United States to check any possible tendencies by Japan’s prime minister to stray beyond justifiable steps to enhance Japan’s self-defense by pursuing regionally destabilizing historical revisionism. This approach reveals clearly that South Korea is using the alliance with the United States as a hedge and platform that boosts its diplomatic clout in its strategic dealings with China rather than placing the alliance up for negotiation as part of its bid to win China’s support for Korean reunification. A strong economic relationship between China and South Korea has brought Beijing and Seoul closer together than ever before, but a strategic sense of common purpose and shared common interest between the two countries remains lacking. As a result, while a stronger China-South Korea relationship may serve mutual interests on some issues, there remain clear limits on the development of the political and strategic relationship between the two countries. Scott A. Synder is Senior Fellow for Korea Studies and Director of the Program on U.S.-Korea Policy. This post appears courtesy of CFR.org and Forbes Asia. Widely quoted comments by China's ambassador to Seoul don't indicate plans for Kim Jong-un to visit China.